Here is an overview of different checkout types that you can use in your Magento store. The checkout is one of the most important functionality of the store. This article will be useful for those who want to optimize checkout process. The aim of this article is to show you all classic checkout types available for Magento and compare them to choose the best solution. Ask for less and they'll buy more. Show less information and they will not go away. Monitor your checkout to make it error-free. Make your checkout secure & HTTPS protected. There are three types of checkout to my mind. Everybody know about default Magento five-step checkout and One step checkout modules, the third one is ... Amazon styled checkout. 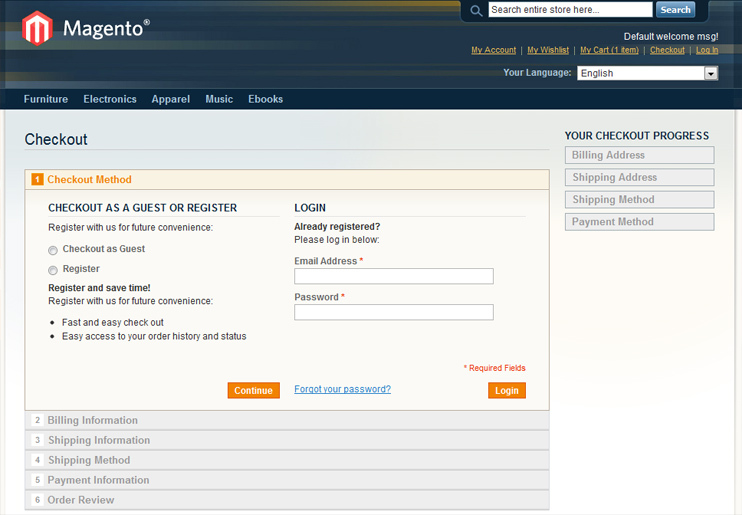 Five-step checkout: Default Magento checkout with five steps. One step checkout: All steps are concentrated on one page for easy access. Amazon style checkout: Advanced and more intellectual type of checkout. It is classic, simple and straight forward way to purchase the product. Most of Magento stores use it by default without any optimization or even design changes. Five-step checkout has too many steps and it is quite long. By default five-step checkout have store header with categories on the top. Remember: Show less information and they will not go away? Five-step checkout is not logical. Why ask password on "Billing information" section? The customer should be focused only on purchase process; there is no need to show all categories of the store during checkout. One click on some category on final step and the customer will need to enter all information again. One step checkout is quite popular solution; there are a number of modules available on the market. The main strategy of such checkout is to show your customer all steps at once, and it is actually one of the negative sides as well. Many people think that this type of checkout is faster, however from other point of view, you show your clients all checkout fields at once. The checkout interface is overloaded. Novice customers will certainly be lost, because the system does not guide them. One step checkout is complicated. There is no any process which guides the customer. By default the One step checkout have store header with categories on the top. 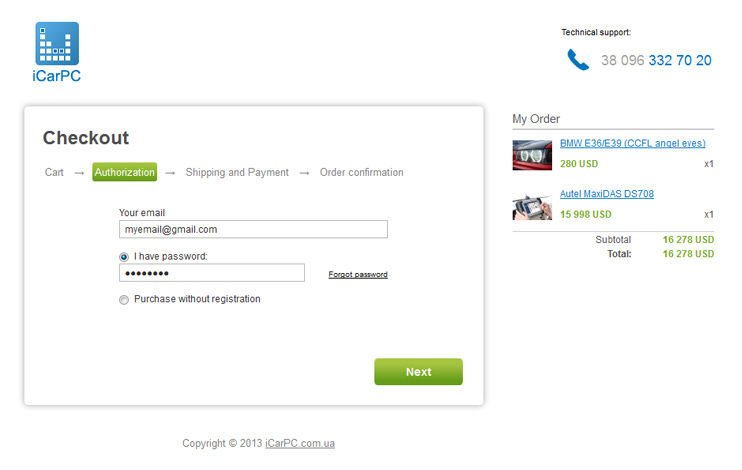 There are so many elements, that customer need to scroll page down to see the Checkout button. One step checkout is not optimized for mobile devices. Such checkout is simpler than Five-step and One-step checkouts. It is more intellectual and effective in the same time. This checkout is simple, it shows your visitors only necessary information. Checkout does not ask any additional questions, there is no any decision such as register or not? Just enter the email and start purchase process. It has only 3 logical steps. It shows the ordered products during checkout process. There are enough places to show SSL/Antivirus protection logotypes or phone number in case your customer will need help during checkout or will have any questions. To summarize, the Amazon style checkout is simpler and easy to understand from the first sight. It gently guides your customers and focuses them on purchase process itself. If you are looking a way to improve your checkout process (e.g. implement Amazon style checkout), contact our team and we will provide you with consulting services. We will be happy to improve your checkout and increase your sales. There is also another style checkout which is focused solely on conversion improvement and that is Awesome Checkout. Google Ecommerce tracking is supported by default Magento checkout. How do you get Google Analytics Goals to track the 5 step checkout? The "Amazon styled checkout" was implemented for our client. So it is exist for Magento and it is real module that we built. 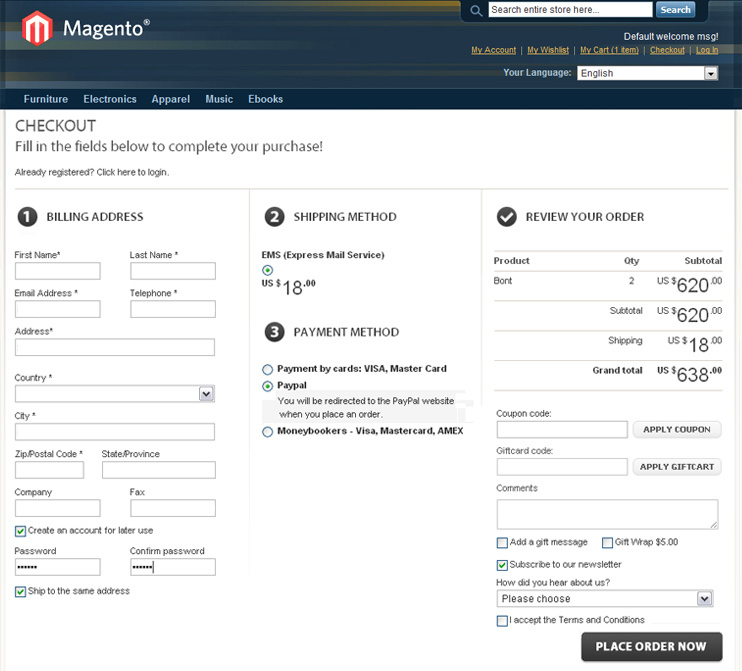 I am assuming that the "Amazon styled checkout" does not exist for Magento and is only shown as an example of a different checkout option that would have to be manually built to be used in Magento?